I’ve read John Hume’s published letter today and – frankly – I have some serious reservations. 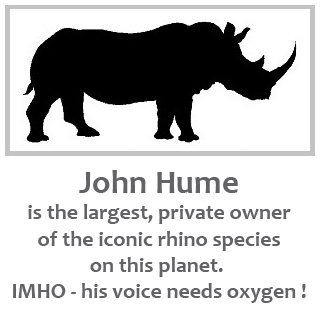 However – because of my doubts – it doesn’t mean that I – or anyone else – cannot engage him on such a critical issue, since he owns the largest private population of rhino on this ancient earth, and therefore has a very significant opinion that should be given oxygen … in my humble opinion. Just as I have said to many folk that there are seemingly “50 shades of grey”, so do I believe possible rhino horn trade covers such a wide ambit. I believe this entire dialogue path on any possible, legalized trade should be carefully – and most objectively – trodden. Have you perhaps read the interview Matthew Wilkinson did with John Hume….a friend and I helped Matt compile those questions to be put to him. I was Very frustrated to get the standard ‘spin’ answers back…..nothing new, nothing to changes…….the points against trade still far outweigh the points for trade, in my opinion. With the possibility of trade being so far off at best, it is irksome to me that the debate still takes up so much time in rhino debate. As an aside, the pro-trade ‘cause’ would have some credibility if it were seen to be doing more than simply pushing for trade. Unlike some anti-traders, I am open to engage with any rhinophiles no matter their stance on trade in the hope that some kind of ‘lightbulb moment’ info comes out of these engagements. Interesting point raised above, so what would you like the so called pro traders to do, is it not enough that John Hume looks after over 800 Rhino, employs a full time vet and Vetrinary nurse, employs a full time private army to look after all of those Rhino, continuouly purchases land for his Rhino, offers to help, but gets rebiffed because he is John Hume. Offers to engage ceaslessly, invites everyone to view his operations, most of whom refuse. I’m just curious as to what evryone wants, must Hume and the Private Rhino Owners do what the Anti Traders want or is the knowledge gained over many years of ownership not good enough. I think that the Anti Traders need to also come to the table and to put their preconceived ideas aside and try to find some middle ground or at least something in common, which should,nt be hard as we are all, supposedly, against poaching..
HOW MANY RHINO HAS MR HUME BRED, AND HOW MANY OF THE 800 WERE PURCHASED. WHAT IS HIS CALVING RATE IN CAPTIVITY? Do the research. John has bred many, many calves, it’s all there for anybody to research, if you care to look it up 🙂 Nothing is hidden. Go to his FB Page and you will find all your questions answered there. I don’t think Mr Hume would be “conserving” rhino if there was no PAYDAY. He doesn’t like them enough that it’s Not a business. You are wrong, Jo. He feels deeply for his Rhinos. But yes, he also has a keen business sense, that is what put in in the fortunate position to indulge his passion – Rhino conservation.